Dear Gen Y, Push The Button! Home/Blog News, Job Search and Career, Sales Success/Dear Gen Y, Push The Button! As a member of Generation Y, I can admit that we are a technology-driven generation and possibly more free-spirited than most when it comes to a job search. I mean can you blame us? With all of this technology, there are so many opportunities to be part of something great, or be part of “the next big thing.” We have been told that we are the future and special and that in turn has led to the argument that we are job hoppers and have a sense of entitlement when it comes to skipping entry-level roles. I can’t argue that there is the desire to be part of something extraordinary and surpass ordinary and mundane, but if I have learned anything from being part of Gen Y, it’s that it’s empowering to know we have the means to change the world. There’s a quote by Napoleon Hill, “If you can’t do great things, do small things in a great way” which I have always found to be true, but sometimes lose sight of. Not all of us will be the next Bill Gates or Mark Zuckerberg…but then again why not? I did not have a coach telling me how many sprints to do or professors telling me what material to study. In fact, I only received support from people assuring me that I would be successful at whatever I did…but what did that exactly mean? Finally, I got it. No one was going to tell me what I should do with the rest of my life and success was mine to define. The summer after graduating, I was fortunate enough to receive the incredible opportunity to be part of a year-long internship program in sports media that I am forever grateful for which helped me pursue my passion for marketing and land an amazing opportunity with Treeline, Inc.
Now with 2013 coming to an end and my one-year anniversary just passing at a company I love, I look back on what I’ve learned. I have learned to “push the button,” a saying my CEO says to me often, meaning believe enough in your own abilities to make an executive decision. Whether it be overseeing budget or implementing a marketing strategy, my colleagues trust in my ability. Without inflating my ego (too much), they remind me that I matter and am part of something bigger than myself, a Gen Y’s dream. 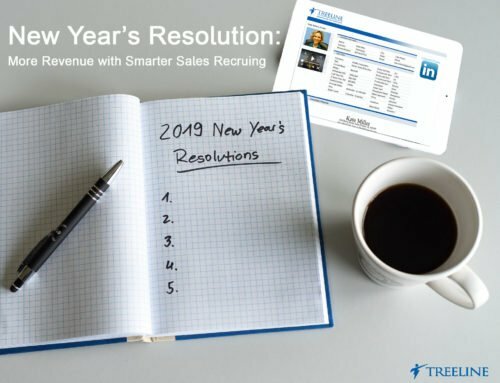 I have made the conscious decision to be present and be part of a growing organization that has changed the sales recruiting industry which is pretty cool might I add. And yes, I am still hungry, still looking to accomplish more. I am constantly looking for new and creative ways to improve and help the company grow. As a member of Gen Y, the way I see it is if given the opportunity to be part of a vision you believe in, go after it. Fully throw yourself into it and be willing to hone and harness your skills. You will not only grow as an individual but contribute to a company’s growth, and who knows you may just be part of the next big thing and change the world. Do small things in a great way. Take ownership of your work and take pride in your projects, understanding your contributions matter. Pursue the passion and not the paycheck. Money is important, but not everything. Do not equate it with happiness. Choose to be happy. Choose to work for a company whose vision and goals you support and realize how important a great work culture is. Share your ideas. Don’t be afraid to share your ideas. Remember it takes more than one person to make a company successful. Commit and follow-through. Don’t give up when things get tough. See each failure and obstacle as a speed bump. Every great success story has chapters about failure.